Jayne W. Di Vincenzo, AIF®, CEP®, president of Lions Bridge Financial Advisors, has been appointed to the City of Newport News Pension Fund Investment Committee. 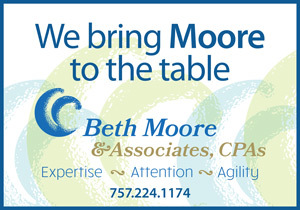 Lauren N. Mundy, CRPC®, associate wealth advisor, has been named a vice president of Lions Bridge Financial Advisors. 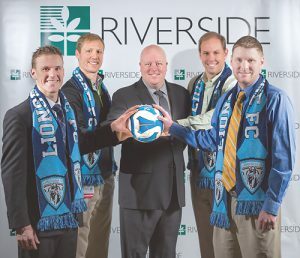 Mundy has been with the firm for six years. Kylene W. Tiller, wealth-planning assistant with the firm, has earned the Registered Paraplanner (RP) designation. RP designation holders have completed a course of study encompassing the financial planning process, the five disciplines of financial planning and general financial planning concepts, terminology and product categories. Tiller has also passed the exam to obtain her life, health and annuities license. Lisa Marie Samaha, DDS of Port Warwick Dental Arts (PWDA)has been published in what is considered the foremost textbook on the therapeutic use of medical ozone: Advances in Ozone Therapy in Medicine and Dentistry. Samaha’s contribution supports the uses of ozone in dentistry for prevention and treatment of dental decay and periodontal disease and for surgical wound healing. Certified in the use of medical ozone for dental care, Samaha is a founding member of the International Academy of Ozone for Healthcare. Samaha is also clinical director of PWDA’s Diabetic and Cardiac Dental Center, created for dental wellness and collaborative medical care. The center accepts patients with sleep apnea and, in collaboration with a board certified sleep physician, can create a dental appliance for the treatment of sleep apnea for those who meet the criteria. 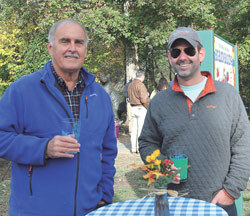 Virginia Living Museum (VLM) hosted 648 guests at its sixth annual Oyster Roast in November. With all-you-can-eat Chesapeake Bay oysters, fresh fried flounder, hushpuppies, steamed shrimp, assorted desserts and much more, the event raised $57,817 for the Museum’s award-winning educational programs and animal care needs. All food at the event was made possible by Phillips Energy Inc., Waypoint Seafood and Grill, Sam Rust Seafood, Inc., Mathews Lions Club, Wild Side Café and Stratford University Culinary department. The event was sponsored by Ferguson Cares; PNC; Women’s Executive Healthcare; Abbitt Realty; Pomoco; Northwestern Mutual/Don Brown; Phillips Energy Inc.; Jones, Blechman, Woltz, & Kelly, P.C. ; Patten, Wornom, Hatten, & Diamonstein, L.C. ; C.A.Barrs Construction Inc.; Allstate/Katy Jones; Empower Information Systems; Village Bank; St. George Brewing Company; Stratford University; Sam Rust Seafood, Inc.; Jeff’s Flowers of Course; Waypoint Seafood & Grill; Mathews Lions Club; Breakthru Beverage Group; and M. Price Distributing, Co. Shown here enjoying the event are (left) Jimmy Hazelwood, a guest, and Stephen Abbitt of Abbitt Realty. Brianne Phillips, DVM, has joined the staff of Virginia Living Museum (VLM) as a lead veterinarian. 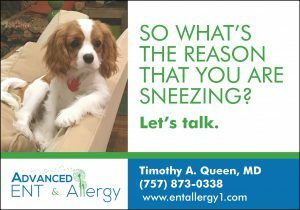 Dr. Phillips is a graduate of the University of Florida College of Veterinary Medicine and has recently completed a three-year residency with the North Carolina State University College of Veterinary Medicine. Phillips joined the curatorial team on a part-time basis as lead veterinarian and works with staff and a team of local veterinary specialists who support the care of the museum’s extremely diverse animal population. VLM has earned a four-star rating from Charity Navigator, America’s largest independent charity evaluator. This rating demonstrates a board dedicated to good governance, a staff focused on financial accountability, a massive volunteer effort and a very generous community. Rebecca Kleinhample is VLM’s executive director. The top agents for November for CENTURY 21 Nachman Realty’s Peninsula Office were Carol Sobieski, top listing agent and top producing agent; Evelyn D. Staton, top closing agent; and Carla Stokes, top selling agent. Fulvia Pilat, a staff scientist at the Department of Energy’s Thomas Jefferson National Accelerator Facility, has been named a fellow of the American Physical Society (APS). The honor is bestowed by members of APS on their peers for exceptional contributions to their fields. Pilat is Jefferson Lab’s acting associate director for accelerators and accelerator program director for the Electron-Ion Collider initiative. She has held leadership positions at Jefferson Lab since her arrival in 2010 and has made lasting contributions not only to Jefferson Lab, but also to the international accelerator physics community. In her fellowship citation, Pilat was recognized for her contributions to the commissioning of the Continuous Electron Beam Accelerator Facility accelerator complex following the completion of its upgrade to 12 GeV. She was also honored for her leadership of efforts toward an electron-ion collider and efforts in support of the Relativistic Heavy Ion Collider at DOE’s Brookhaven National Laboratory. Pilat accepted a position as director of the Research Accelerator Division in the Neutron Sciences Directorate at DOE’s Oak Ridge National Laboratory. Ralph White has joined Whole Foods Market Newport News as its new store team leader. White has worked for Whole Foods Market for more than 10 years and at six different stores throughout two regions, serving as a store team leader in three of those stores. The Newport News Police Foundation received hundreds of stuffed animals for distribution to children during emergency situations from PetSmart, Inc. The largest funders of animal welfare in North America, the company donated 10 percent of sales from its Holiday Philanthropic Collection to PetSmart Charities® and PetSmart Charities™ of Canada. Pictured are PetSmart staff members presenting Newport News Police Department officers and the Newport News Police Foundation with donated stuffed animals, which will be given to children to aid in comfort during difficult situations. Amanda Wroten is executive director of the Newport News Police Foundation. The Third Annual Langley for Families Charity Golf Classic raised more than $233,000 on September 11, with 140 golfers participating at the Golden Horseshoe Golf Club in Williamsburg. The event was held to raise money and awareness for Hampton Roads charities. To commemorate the anniversary of 9/11, a moment of silence was held for the victims and first responders. A $2,500 check was presented to Vigilant Watch, Inc. to provide support to first responders and their immediate families in Hampton Roads. 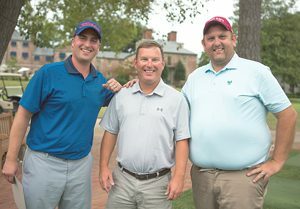 Pictured (from left) are Ryan Sherwin of ALM First Financial Advisors, winner of a trip to Punta Cana, Dominican Republic for the David Ortiz Celebrity Golf Classic; Tom Ryan, Langley president/CEO; and Jon Jeffreys of Callahan & Associates, winner of a trip to Scotland. Newport News Sheriff Gabe Morgan has been selected to sit on the newly created National Leadership Council of Fight Crime: Invest in Kids. The organization, comprised of more than 5,000 police chiefs, sheriffs, prosecutors and violence survivors, makes the case for solutions that reduce crime and steer children towards productive lives. Sheriff Morgan has been a member of Fight Crime: Invest in Kids since 2007. He joins the nearly 30 elite law enforcement leaders and violence survivors from around the country on the council. Virginia Health Services (VHS) has created a new training center for its professional caregivers to meet the demands of the ever-changing healthcare industry. The Employment, Enrichment and Education Center has opened in Port Warwick on Styron Square. Jeffrey L. Mendelsohn is CEO of VHS. Trevor Anderson has joined the law firm of Cowardin, Kim and Riddle (CKR). Anderson is an experienced trial and transactional lawyer with an extensive background in criminal, domestic and civil litigation. Prior to joining CKR, he worked as a senior associate for a litigation firm based in Alexandria, Virginia. Anderson earned his B.A. degree from Virginia Tech and his J.D. degree from The Catholic University of America, Columbus School of Law. Prior to going into private practice he clerked for the Maryland State’s Attorney for Prince George’s County and the Honorable Patricia A. Broderick of the Superior Court of the District of Columbia. He has been selected for inclusion in both the American Institute of Criminal Law Attorneys’ 2017 “Ten Best Attorneys” list for Virginia as well as the National Trial Lawyers’ 2017 “Top 40 Under 40” for criminal defense. The Village Doctor, located at 10234 Warwick Boulevard, has joined Tidewater Physicians Multispecialty Group (TPMG). The practice, led by John Brady, MD, will remain at the same location and will continue to offer a wellness program, led by Virginia Koninski, RN, featuring education on healthy living and plans individualized for patients’ success. Brady received his medical degree from the Medical University of South Carolina and completed his family medicine residency through Greenville Hospital Systems, where he served as chief resident. and Friday, 8 am to 4 pm. Stephanie Huffman is division manager. Winners of the ninth “ZOOM IN on Newport News” photo contest, sponsored by the Newport News Tourism Development Office, have been selected.Jerry Gammon of Hampton won the Grand Prize in the professional category for his entry, “Fall at Riverview Farm Park,” taken near Menchville High School. Honorable Mention was won by Sarah Clark of Yorktown for her submission, “Mariners’ Dance,” taken at The Mariners’ Museum. Denise Wells of Hayes won the Grand Prize in the non-professional category for her entry, “Sunset Fishing,” taken at Denbigh Docks. Honorable Mention was awarded to Aaron Pritchett of Newport News for his entry, “Reflecting on the Past, Looking to the Future,” taken at Lee Hall Depot.Grand Prize winners will each receive $500. Honorable Mention winners will receive free admission passes for four to all Newport News attractions. 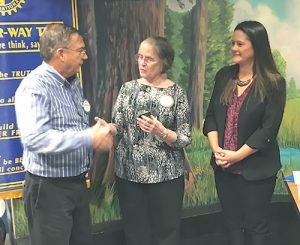 The Rotary Club of Warwick @ City Center presented club member Rusty Sprouse with his third Paul Harris pin for membership recruitment by Rotary International. Pictured (left to right) are Sprouse; Carol Chamberlain, foundation chair; and Jennifer Daknis, club president. 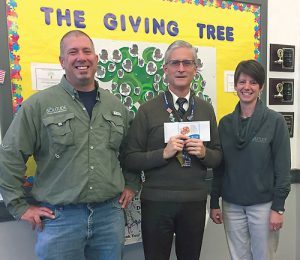 SOLitude Lake Management’s Aquatic Specialist Todd Schramm (left) and Environmental Scientist Krista Michniewicz (right) deliver gift cards to Bob Magnuson at Oxford Central School in Oxford Township, NJ, as part of SOLitude’s Little GOBBLERs program. 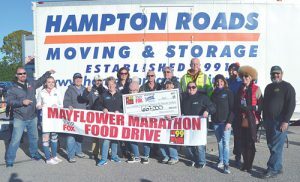 Participating in the 21st annual Mayflower Marathon of the Virginia Peninsula Foodbank and the Foodbank of Southeastern Virginia and the Eastern Shore were its donors, community partners, sponsors and 106.9 The Fox and FM99. As a result of the dedication and teamwork, the Foodbanks were able to provide more than 667,000 meals for the holidays across Hampton Roads. The Newport News Chapter and the National body of The Moles presented a resolution honoring Katherine Goble Johnson for her outstanding achievements, leadership, dedication and service in the fields of mathematics, science and aeronautical engineering. Johnson was honored for setting an example as a pioneer woman in the aerospace field, her 33 years of groundbreaking service and work at NASA Langley, her excellence in mathematics and education, receiving the Presidential Medal of Freedom from former President Barack Obama, her achievements and portrayal in the book and the Oscar-nominated movie Hidden Figures, and her historical contributions to the community as well as the country. Presenting the resolution is Bonita Hunter, Newport News chapter president.